Your bridesmaids are an important part of the style of your wedding.These are some ideas on hairstyles that you can suggest for your bridesmaids. Brides have different feelings on how far they should go in determining the look of their attendants. On the one hand, you want to make sure that all of the members of your bridal party look their best; on the other hand, it is not really nice to demand that they all conform to an exact look of the bride's choosing. This is why it can be best to frame your thoughts in terms of gentle suggestions for hairstyles, rather than as non-negotiable demands. 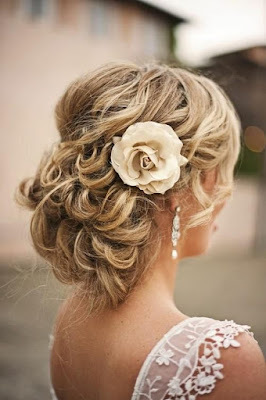 When you are looking for bridesmaid hairstyles, the best place to turn is the bride's own hair. You certainly do not want your bridesmaids to have the same hairdo (that would just be weird! ), but they could have a similar flavor, one that is in keeping with the ambiance of your wedding. Your bridesmaids' hair should also suit the formality of your event, as well. 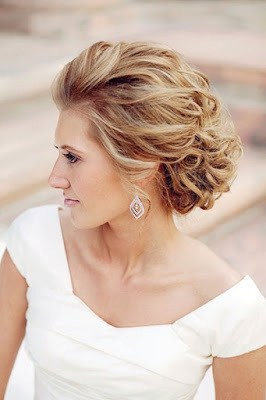 For a more formal wedding, it would be appropriate to request that all of your attendants wear their hair up. This ensures that everyone will look neat and polished. Updos can be expensive, depending on where you live, so if you know that shelling out an extra $85 (or more!) 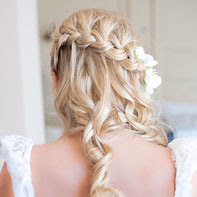 will be a burden for one of your bridesmaids, it would be thoughtful to discreetly offer to pay for her wedding hair. As to the specific hairstyles to consider, two great options are sleek and classic or natural and soft. For a sleek and classic look, styles like chignons or low buns are very elegant and easy to wear. If you prefer a more natural look for your wedding, then request that your bridal party try hairstyles such as soft waves pulled back into loose buns. If you are having a fairly formal wedding, it could be very pretty for your bridesmaids to wear some sort of small ornament in their hair. Little hairpins or crystal clips can make very nice bridesmaid gifts. You might want to give hair jewelry in addition to bridesmaid gifts such as earrings and necklaces. This is because, while the bridesmaid jewelry will be something that your friends will be able to enjoy again in the future, the hair ornaments are pretty much just for your wedding. Beach weddings call for an entirely different type of bridesmaid hair. Styles should be informal, relaxed, and well, beachy. One of the best looks is to wear the hair pulled partially back, allowing some of it to cascade over the shoulders. The nice thing about this, as opposed to wearing the hair all down, is that it allows the hairstylist to create more of a definite style. 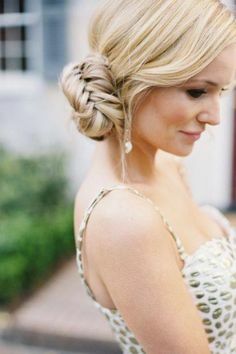 Depending on the texture of the bridesmaid's particular hair, she could have it pulled back smoothly on the sides, have a little lift at the crown, or she could pin back loose waves over her ears. Your wedding is your day, and you want for everything to be as beautiful as possible. Without making unreasonable demands, it is still possible to guide your bridesmaids into a general type of hairdo for the big day. Not only will a great hairstyle help them to look their best, but it will help them feel gorgeous as well. 0 Response to "Bridesmaid Hair Ideas"